ILT offers ISO17025 accredited calibrations of miniature and hand-held spectrometers, spectroradiometers, illuminance spectrophotometers and color meters used for testing lux, CCT, CRI, spectrum, color and wavelength. 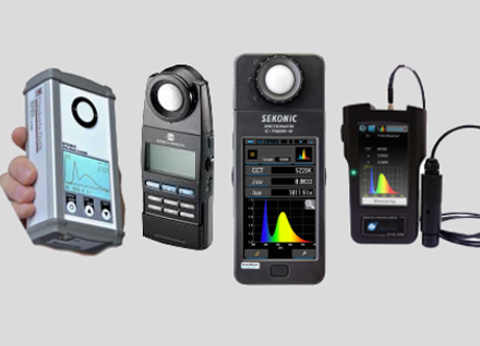 Hand-held, visible illuminance spectrometer systems typically measure light over the range of 380 - 780 nm. 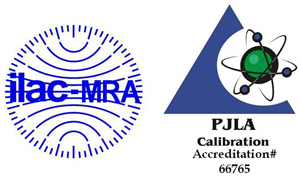 ILT offers validation of the irradiance (W/m2/nm) or illuminance (lux) measurements as part of standard calibration as well as validation of the systems wavelength calibration. Depending on the spectrometer's sensitivity, calibration may be extended over the range of 200 - 1100 nm. Additional testing is also available to validate the spectrometer's calculations for CCT, CRI, DUV, peak find, and more. Standard calibration does not include changing the internal calibration file for non ILT hand-held and miniature spectrometers. However, if the spectrometer software allows the end user to import the new calibration files, ILT may be able to apply internal modifications. (Computer with pre-installed software may need to be provided by the customer). In cases where the software is not accessible, ILT will provide all of the data required to allow the customer to correct the readings using Excel or similar external 3rd party programs. Each spectrometer calibration is unique to the exact configuration used during calibration. Any changes to optics including fibers, input optics, integrating spheres, etc. will impact the accuracy of the reading. ILT recommends every unique configuration to have its own calibration. ILT requires all orders be sent with an RMA. Click on the RMA button above to request one. Price quotes can be obtained by selecting "Yes" to the Quote Needed Prior to Service question on the form, or by emailing us at ilservice@intl-lighttech.com, or calling us at 978-818-6180 x118. A list of commonly calibrated models is below. Use the drop down to search by meter brand. If you do not see your meter listed below, please contact us to confirm we support calibration of that meter.